Could childhood sweet eating make you violent? Children who eat sweets and chocolate every day are more likely to be violent as adults, according to UK researchers. The Cardiff University study involving 17,500 people is the first into effects of childhood diet on adult violence. It found 10-year-olds who ate sweets daily were significantly more likely to have a violence conviction by age 34. Researchers suggested they had not learnt to delay gratification, but other experts said already "difficult" children might be given more sweets. The researchers looked at data on around 17,500 people and found that 69% of the participants who were violent at the age of 34 had eaten sweets and chocolate nearly every day during childhood, compared to 42% who were non-violent. 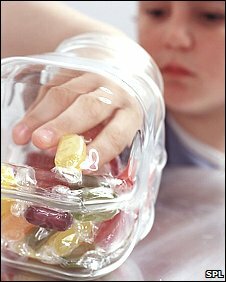 This link between confectionery consumption and later aggression remained even after controlling for other factors such as parenting behaviour, the area where the child lived, not having educational qualifications after the age of 16 and whether they had access to a car when they were 34. The researchers put forward several explanations for the link including the idea that the confectionery makes the adult addicted to certain additives and that these may contribute towards adult aggression. The study was reported in the British Journal of Psychiatry. Dr Simon Moore, who led the study, has carried out previous research on young offenders. He was aware that they tend to have very poor diets including lots of confectionery - but was intrigued to find the link. He said: "Our favoured explanation is that giving children sweets and chocolate regularly may stop them learning how to wait to obtain something they want. "Not being able to defer gratification may push them towards more impulsive behaviour, which is strongly associated with delinquency. "Targeting resources at improving children's diet may improve health and reduce aggression." Professor Alan Maryon-Davis, president of the UK Faculty of Public Health, said: "Another explanation is that children who are already more demanding, aggressive and 'difficult' are more likely to be given sweets and chocolates to keep them quiet for a while. "It is an interesting area that needs looking into a little more deeply." Julian Hunt, Food and Drink Federation (FDF) director of communications, said: "This is either utter nonsense or a very bad April Fool's Day joke. "Anti-social behaviour stems from deep-rooted social and environmental factors, such as poor parenting and a deprived upbringing, and is not linked to whether or not you ate sweeties as a kid. "How anyone could leap to such a conclusion is beyond me." But Dr Simon Moore said: "We are fairly confident that this is a realistic relationship - the key is explaining what the mechanism is behind this relationship. "We think that rewarding bad behaviour in childhood with confectionary can lead to later problems but we need to look at this more closely."